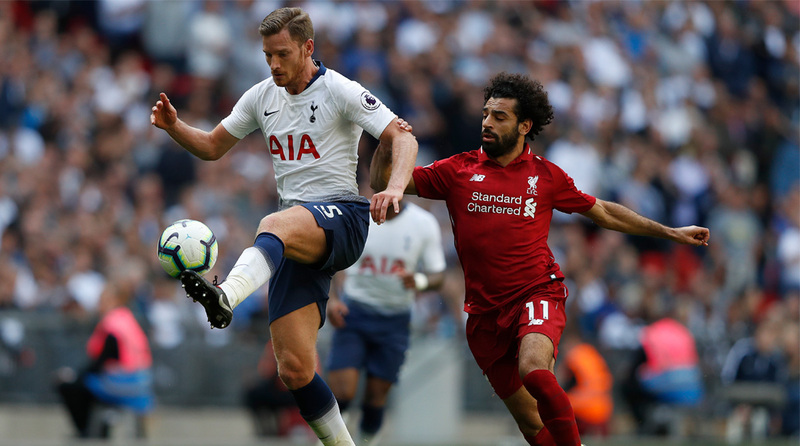 Tottenham Hotspur vs Liverpool was billed as the highlight fixture of the Premier League weekend and Saturday’s game at Wembley Stadium didn’t disappoint as the Reds eked out a 2-1 win to go three points clear. Jurgen Klopp’s men were the dominant side for large swathes of the tie, but the manner in which the Lilywhites imploded was shocking. After their surprise loss at Watford, Mauricio Pochettino had demanded a response from his players but he was disappointed in ways more than one as the North Londoners seemed incapable of keeping the ball and kept gifting their opponents chance after chance. Georginio Wijnaldum headed the Merseyside outfit into the lead ahead late in the first-half before Roberto Firmino prodded in from close range to double their advantage after the interval. Spurs had their chances too, but it wasn’t their night and by the time Erik Lamela reduced the deficit, it was too little too late and Liverpool held on for their fifth win on the trot. Clearly not in Hugo Lloris’ league, even if he tried his best. Made a couple of key saves, but shares the blame for the Firmino goal. Struggled to get up the pitch until the latter stages and by the it was too late. Defensively was okay, not his best game for sure. Once your midfield sells you short on a number of occasions, there’s little you can do, but the Belgian did his best. Just like his compatriot, didn’t do much wrong as he was left to dry far more times than he should have. Defensively did okay, but his offensive contributions were found wanting. Set-pieces were below the mark. Sloppy from the off and didn’t manage to recover. Clearly the mercurial Belgian was having one of his rare off-days as passes were going straight to Liverpool players. Industrious display from the comeback man, but he looked a little off the pace. Nowhere near his influential best as he struggled the link up with Moura and Kane. Spurs’ brightest outlet, always snapping at the heels of the Liverpool defence. Should have scored when he glided past three Liverpool players in the second-half though. So far, it doesn’t make for pleasant viewing as Kane looks far too sluggish. With a busy fixture list looming, looks unlikely that he will get much of a rest so will just have to play his way out of this ‘slump’. Missed a sitter but made amends with his fine finish at the death. Perhaps should have been introduced earlier. Another substitute who made a real difference, or at least should have. Replays proved he should have won a penalty with the last chance of the game. Replaced the disappointing Dier in the final stages. Wasn’t really tested in goal, but his distribution was pretty decent. Not at fault for Lamela’s strike, even if he did get the slightest of touches to the ball. Limited in his forays into opposition territory, but a creditable outing from the Scotsman. Almost scored early in the second-half. Shackled Kane fairly well, but was comfortably outshone by his defensive partner. Excellent display from the young defender and if he keeps this up, then Dejan Lovren and Joel Matip will find it to get back into the starting XI. Lucky to avoid a caution for his high challenge on Rose in the first-half. At times it looked like Moura and Co were targeting the veteran and while he didn’t have a great game, it wasn’t his worst either. The Dutchman has been superb since the start of the season, perhaps galvanised by the increased competition for spots. Excellent header to give the Reds the lead and overall was solid. Justified his inclusion ahead of skipper Jordan Henderson with an assured display in the engine room. Direct as always, but lacked that cutting edge in the final third. The Brazilians’s resurgence continues and it’s now two goals in as many matches for the hardworking frontman. Excellent build-up play, but couldn’t quite put the ball into the back of the net. Would this have happened last season? Probably not. Replaced Firmino in the final quarter and did fine as the Reds saw off a late Spurs surge. Came on for Keita and didn’t really get the ball in a dangerous area to have any impact. Took the place of Alexander-Arnold but couldn’t prevent Spurs from scoring a late strike.